Take a trip to The Wilderness…. in Walkerton! Lake, Pond, Mini Farm, and More! Fun @ the Wilderness all day on the 19th with camp out and faith building activities at night. Everyone will go to church together on the 20th @ 9:15 with parent pick-up at church. Better weather lies ahead and with that, much in the works for teens involved in community and real service through BLC. At the Easter Breakfast, we will reveal ~ The Wall of “Money for Something” – Envelopes labeled 1-100 are presented for purchase (“give what is listed on the front of each envelope). Inside each envelope is a service to be exchanged for the purchase of the envelope along with your contacts name and number to do the work. Remember, you need to follow up and contact the future worker in order to arrange for the work. July (tbd): A day trip to a Chicago Soup Kitchen and a Chicago White Sox game. July (tbd): A camping overnight and friendship foundations builder trip to the Wilderness (in Walkerton). August 11-13: 3 day team building mission trip to Ann Arbor, Michigan led by college age, former BLC mission trip leaders. All inclusive event includes meals, accommodations, and team building activities with private beach and pool time as well as other teen groups visiting at the same time. The BIG DAY of Serving is a intense one day mission experience for teens in a nearby community. For Bethany, that will be in Chicago on May 18th! Don’t miss this opportunity to serve with other area teens in a community area that needs our help! Your efforts will truly make a difference and can impact the lives of those in the area you serve! BLC IS COVERING THE COST TO GROUP. Free-will donations to help offset the cost are appreciated. Participants will need money for snacks/dinner. Group will leave from BLC at 5am (returning at around 6:30pm). REGISTER NOW! SPACES ARE LIMITED! Every Sunday this Summer! 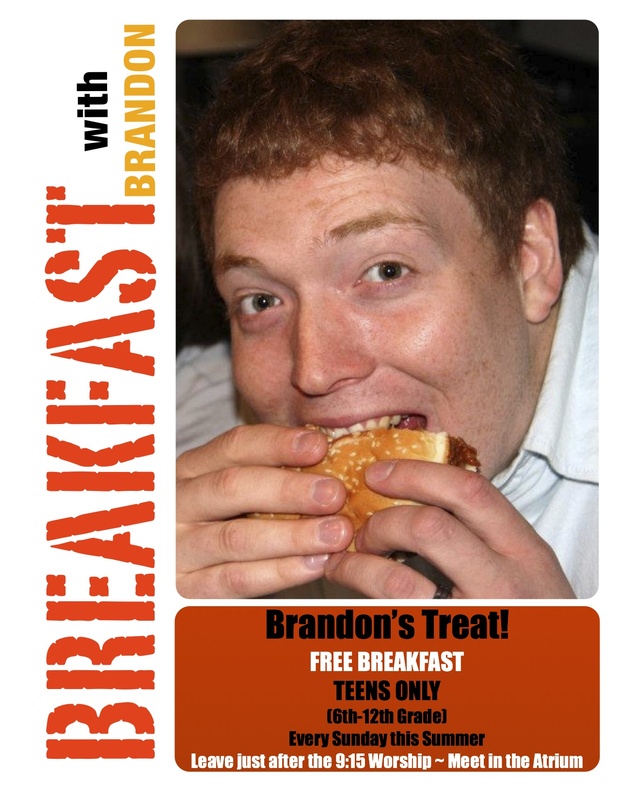 FREE BREAKFAST (Brandon’s treating!) for teens (grades 6-12). Meet in the atrium after the 9:15 worship service (hopefully you’re coming to it!). If you’re late and miss your ride, you’ll miss out! !